Foremost Electronics, the specialist distributor of electromechanical components, has introduced nine emergency stop switches from the IDEC e-stop series. The new products include the IDEC XA, X6, XN1E/5E, XN4E, EU2B, FB1W, XW, HW and YW product ranges. IDEC are manufacturers of high reliability push buttons and DIN-Rail power supplies. With their patents of 3rd generation safety technology the new range of emergency stop switches provide optimal safety by conforming to international approvals: UL, TUV, ATEX, CE, and CCC. 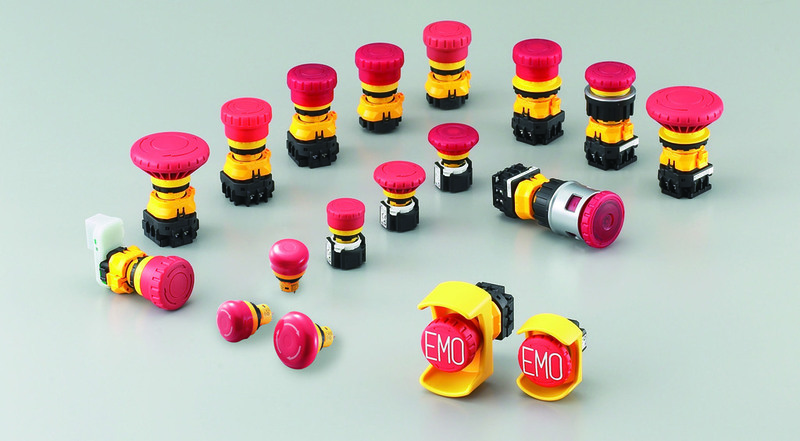 The 9 new series of emergency stop switches include a very wide variety of options including: 3 plunger diameters (30, 40 and 60mm), 3 plunger colors (yellow, red and grey), the availability of Illuminated versions, 16, 22 and 30mm panel cut-outs, several methods of connection, 4 types of reset functions: twist, pull, both (when required) or key, reduced size and offer greater flexibility in the number of contacts, from 1 to 4 with normally open (NO) or normally closed (NC) variants. Because user safety is vital, IDEC has developed two patented technologies that go beyond today’s most stringent standards. By reversing the position of the spring, the contact’s relaxed state corresponds to its safety position (when contacts are open, the machine is at a standstill). The spring does not undergo any load once the plunger has been pressed down and as a result, all risks of malfunction are significantly reduced, especially when the push-button has been damaged. By using the safe brake action technology, the emergency stop is put in its safety position (contacts open) whenever the “On” button is not properly positioned, has been damaged or is detached. In this position, any risks resulting from poor installation or damage are completely avoided. Several of the new IDEC emergency stop switches are fitted with these innovations, including the XA, X6, XN1E/5E, XN4E, and XW.